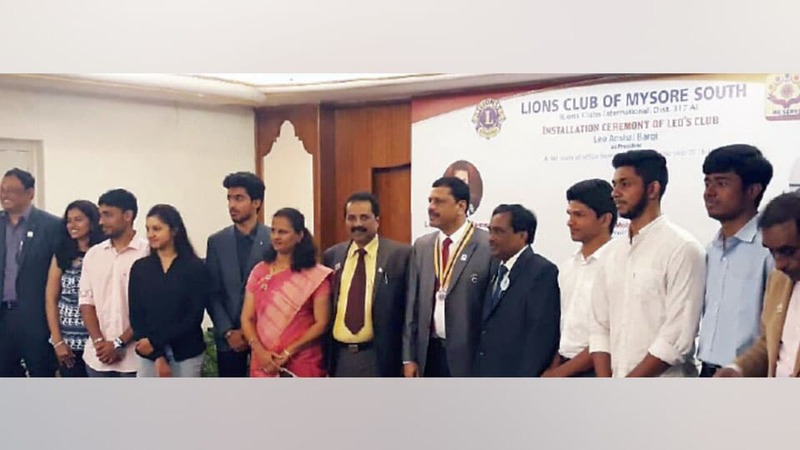 The Installation Ceremony of Leo Club hosted by Lions Club of Mysore South was held at Kings Kourt Hotel recently. Seen in the picture are Second VDG Ln. G. A. Ramesh, Lions South President Ln. K. K. Mohan, RC Ln. Suresh Babu, Secretary Ln. Santhosh, Treasurer Ln. Tataji, Young Scientist N.M. Prathap, Outgoing President Leo Apoorva, New President Leo Anshul Bargi, Secretary Leo Sanjana, Treasurer Leo Ashlin, Leo mentor Nayana Kiran and others. Lions Club of Mysore South also distributed Uniform T-shirts to students of Higher Primary School in Nachanahalli Palya which is adopted by the Club.